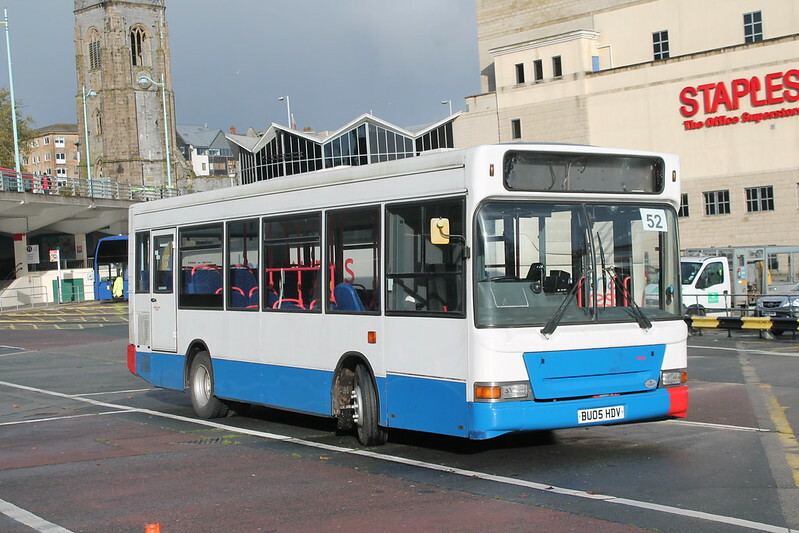 Jacketts Coaches have more of a presence in Plymouth these days with both the 13 Saltash Passage route from Plymouth Citybus and the 52 Derriford – Plympton which has been a Target Travel route for quite a few years. One bus I have seen on the 52 is this little Dart which Richard capture on camera a while back. Although the sticker on the windscreen says 52 it clearly was not working that route when the photo was taken. Jacketts have two of these buses and at least one of them still has no working destination display. I have not been able to get any photos myself as its too dark when I get to Derriford on the way home. The other reason is that it is still rare to actually see it at Derriford as its never there when it should be (at least not the 5:15 pm departure. It has to be said that they are struggling with the 52 at the moment but it is a very difficult route to serve especially in the evenings. Have travelled on the 13 a couple of times and passengers seemed happy with the service. Many were on first name terms with the driver and certainly there was a very good atmosphere on the bus on both occasions. I don't think any of the larger companies wanted to run this particular service so perhaps this is where smaller independents like Jacketts are ideal to fill such a role.